I have a WMV file, and I want to edit in iMovie. However, iMovie doesn't support WMV. Is there any way to convert WMV to iMovie? Can you recommend me some reliable converter tools for WMV conversion? Just as the inquiry puts, all you need is an all-round video converter to convert WMV to MOV, the default format for Mac. We've noticed that countless video converters are available on market, some are free and some paid. Here we collect 5 common WMV to MOV converters online and an advanced desktop video converter for your reference. Before getting started, I have to point that the desktop converter is more efficiently and effectively in video conversion when compared with free online tools. Wondershare UniConverter (originally Wondershare Video Converter Ultimate) features in batch converting video and audio files at 30X faster speed than other competitors. Different from those free WMV to MOV online converters, there's no limitation in the maximum file size for the WMV video (to be converted). Moreover, it provides many other powerful functions like edit video, burn video to DVD, stream video to TV, etc. For more details, you can check how to use Wondeshare UniConverter (originally Wondershare Video Converter Ultimate). If you want to know more about WMV to MOV on Windows/Mac, go to How to Convert WMV to MOV on Windows 10/Mac. Below are the 5 commonly-used tools with which you can freely convert WMV file to MOV format online. Now let's view them one by one. BenderConverter will be my first recommendation as a free online WMV to MOV converter. Its clear and well-organized interface ensures you how simple the video conversion is. To convert WMV to AVI online, you just need to upload your WMV file (less than 100 MB), select QuickTime Video(.MOV) as output format under the video category and click Convert to proceed. Like Benderconverter, Converterfiles also has a simplified interface and shares the similar converting process. The major differences lie in that Converterfiles supports 250MB file size and more output format options. Apart from video/audio files, it also supports document, presentation, image and more. Just try this free online WMV to MOV converter. Cellsea Converter is an advanced free online WMV to MOV converter and video editor. It is also a powerful ringtone maker and photo editor. To convert WMV to MOV online, your WMV must be less than 25MB. Note that it supports video conversion only. If you want to convert audio files, I'm afraid it doesn't work here. 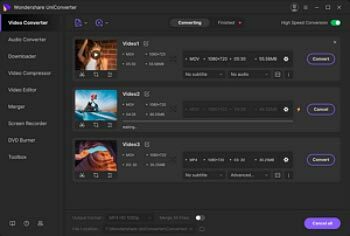 ClipConverter is another free online WMV to MOV converter. It converts your media URL into MP4, 3GP, AVI and MOV at high speed and allows you to set video segment from the converting options. After all settings are ready, you can click the Continue button to start WMV to MOV conversion. Integrated with MP3 converter, Firefox add-on, Chrome extension and Safari extension, OnlineVideoConverter converts video to and from AVI, MP4, FLV, MOV, etc. Aside from uploading your desired WMV video from local PC, it also lets you convert videos by entering a media URL.